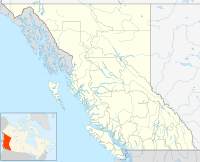 Edgewood is a settlement in British Columbia, Canada. It is located on the western shore of Arrow Lake. An internment camp was set up in Bunk houses in Edgewood from August 1915 to September 1916. In 2008, there was a 181-hectare forest fire just outside Edgewood. ^ "RCMP investigate 2 suspicious deaths in Edgewood, B.C." CBC.ca. 30 March 2009. Retrieved 25 November 2010. ^ "Smoke lifting from Edgewood blaze". CBC.ca. 22 July 2008. Retrieved 25 November 2010. This article about a location in British Columbia, Canada is a stub. You can help Wikipedia by expanding it. This page was last edited on 24 October 2018, at 01:14 (UTC).